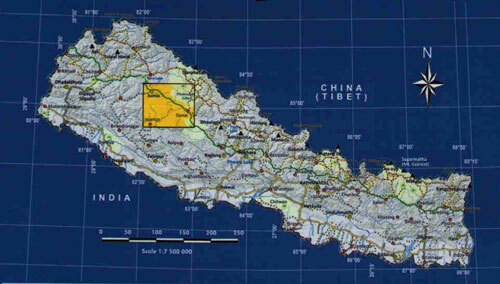 Trekking map of a large area centred on Dho Tarap, lying between the Upper and Lower Dolpa regions. Coverage extends from Jomsom and Muktinath in the south east to Kanjirowa peak in the north west. Much of the Shey Phoksumdo National Park is thus included. Trekking routes include the Dolpa Experience circuit and routes connecting Jomsom to Ringmogaon.